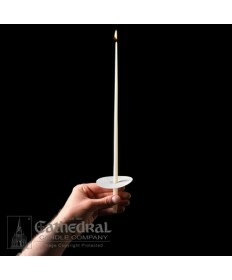 Congregational Candles and Candlelight Service Candle Sets, crafted from the finest 51% beeswax or white molded stearine wax. Excellent for use at special services for Christmas and Easter. A wonderful addition to any church ceremony when you're looking to add drama to the Liturgy. 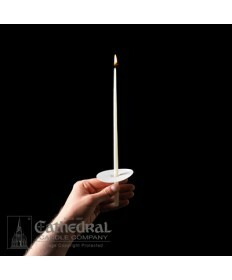 Also appropriate for prayer vigils, memorials and other special gatherings indoors or outdoors. Devotional #1 Stearine Candles 6 1/2" x 17/32"
Devotional #2 Stearine Candles 5 1/2" x 17/32"
Devotional #3 Stearine Candles 4 1/2" x 17/32"
Orthodox Tapers 100% Beeswax Unbleached 1/4" x 11"
Orthodox Tapers 100% Beeswax Unbleached 3/8 x 11"
Orthodox Tapers 100% Beeswax Unbleached 7/16" x 11"
Orthodox Votive Candles 7/16" x 10"